I want to tell you a story. It’s a wide-ranging, galaxy-spanning tale that feels both fresh, but eerily familiar. It’s a tale of ordinary human beings doing extraordinary things through love, kindness, shared sacrifice, and compassion, but all for the sake of purpose. It has heroes and villains, and despite its setting, it could accurately be described as a war fought on both a temporal and heavenly plane. Through the decades of the Star Wars canon, the stories have been filled with redemption and human fallibility amongst something greater, in a manner most movies wouldn’t even attempt. Despite its missteps, many from the original creator, the rebirth two years ago brought critical and audience acclaim. Its 2016 side story made big money as well, despite being entirely inessential to a larger understanding of the main plot. Star Wars: The Last Jedi arrives this weekend amidst intense hype and expectation, and I am happy to report the excitement is well-founded. This is a great film, one I absolutely loved, and one where the biblical and theological foundations underlying the space combat and western elements are impossible to deny. In fact, I would go so far as to say that those who walk in as unbelievers might even feel a tinge of the “Force” before they exit the theater. God willing, that’s exactly what will happen. It’s impossible to review the movie in any detail without giving something away, so instead of talking about virtually any specific regarding The Last Jedi, I’m going to speak more about The Force Awakens to inform upon what’s to come. First, if you liked Episode VII, it’s unfathomable you wouldn’t subsequently enjoy this movie. Whereas that film was almost a direct retelling of A New Hope for the younger generation, many will compare the 2017 installment to The Empire Strikes Back. The similarities are certainly there to be found, even down to the strength of the antagonists, but that’s not germane to Star Wars. In a trilogy scenario, the second film is always going to be where things are at their bleakest. The cliffhanger or “To Be Continued” set-up sequence needs to have a distinct tone of unease behind it, and to do it, usually the light has to suffer at the expense of the dark. It’s what leads to the ultimate David vs. Goliath moment in any number of fictional properties throughout time. The Empire Strikes Back gave away its penultimate status even within its own title. While The Last Jedi isn’t a straight forward “number two” movie in that mode, the struggle is most definitely real. As I watched The Force Awakens again yesterday morning as a refresher beforehand, the sheer level of biblical and religious imagery harmonized in my direction as if it were literally angels singing from above. Even the cloaks and the beards are screaming at you watching this thing, and it’s awesome. In the beginning was the Force, something that runs between the margins and the extremes of life. It surrounds us all, and in fact, when unlocked, it reveals itself in those who believe, and also protects them. It can be corrupted, but only for a time. Evil prospers and even thrives, but there’s a balance to be found and a time of reckoning. While not all control the Force, it exists in all of them. Other than Jesus, his disciples, and a select other few, no one performed miracles on Earth. But when necessary and appropriate, they did. Over and over, the mistakes characters make in these movies come when men and women act outside the confines of the Force. When they assume they have the right answer, understand things, and rely on their own understanding, they fail spectacularly. When guided by the Force, which we can extrapolate to mean the Holy Spirit, anything is possible. Faith can move mountains. Kylo Ren (Adam Driver) is the perfect example of the possibility of a Prodigal Son, whether realized or not. Recall the conversation between this First Order leader and his famous father, Han Solo. He tells his dad, “It’s too late,” in reference to turning away from the Dark Side. “No it isn’t. Come home.” The lasting message of Star Wars might well be found more in the redemption story than those always existing on the side of light. The central memory from Return of the Jedi, at least for me, was Darth Vader’s realization of his own insignificance outside of the love and care he could show to those in his life, and the final transfer of power away from oneself. This was a man, presented as a monster, corrupted through his desire for power and the manipulation of malevolence within him, who basically walked through fire, was burned, but in the end was not set ablaze. His scenes known for dark shades and deep reds, but the final image was of the old Anakin Skywalker standing next to the prophetic figures of Obi Wan Kenobi and Yoda. Without Vader’s transformation, Jedi doesn’t have nearly the same effect. Vader’s shift proved that in the Star Wars universe, it’s never too late. That’s also the message of Christianity, where salvation is attained through faith, not good works. After so much misery, he found inner peace and contentment through an act of sacrifice that cost him his life. His penalty for sin was death, but as we see him with his two former adversaries and frenemies, we witness a semblance of the essence of grace. We also see the pull of the temporary delights of the world eventually falling in the face of eternal purpose. We first saw the initial selfishness of characters like Han Solo or Finn geared to grab for the temptations and safeguards of the world, but once those individuals began listening to their hearts and not their heads, the degree of sacrifice and willingness even to die for the cause became apparent. There is no greater gift than to give one’s life for others, and throughout The Last Jedi, key contributors are asked internal questions that put them in eminent and fatal danger. The stakes of The Force Awakens were powerful, but the story of this film is exponentially more fulfilling because of the growth shown in nearly every major character. John Boyega’s Finn, which experienced stages of change in The Force Awakens, expands mightily and believably. Here, he shows what a disciple he truly becomes, and as his pull to Rae (and others) prevails, he drops everything and follows. He leaves his fishing net behind and takes the walk. He discovers purpose and in the process, his apprehension and fear lose its hold over him. Some other characters fight that inherent maturity, because there’s another movie to sell, but it’s there to be observed at the very least. If there’s a difference to be found between the Jedi and the Empire, the Resistance and the First Order, other than the obvious, it’s this, and it also explains why the good will always triumph over the evil. Luke, Leia, and the protagonists are engaged in warfare, but not for personal gain. The only goal is freedom for all peoples from tyranny. Wealth isn’t concentrated through the group, and although there’s a hierarchy, there’s a righteousness behind the fight. The Light isn’t seeking to gain any shiny new trinket, other than unopposed free will. In contrast, the Dark Side looks for more power, more dominance, and more control in the world its members inhabit. It looks for its One Ring to Rule Them All. When it’s never enough, you’re always at a disadvantage against those playing in a non zero sum game. The Resistance takes up weapons, usually in defense, just to survive or to avoid assimilation into an authoritarian state. Nothing changes in The Last Jedi, because when a story has worked for thousands of years, it would take an astonishing level of arrogance to change it all that much. The battle to be the most powerful almost always ends in a realization that someone is greater than you. That person isn’t generally involved in the wrestling match either. He or she waits in the balcony, watching the futility below. You can have mansions filled with stacks of cash, but someone will have a bigger one. If you choose your wife or husband based solely on appearance, you’ll be crushed when you figure out there’s a more beautiful person out there, and as you age, the aesthetics fade. Plus, when one recognizes he or she came from dust, and to dust he or she will return, acquiring “stuff” fails to satisfy desire. Rey (Daisy Ridley) was offered 60 food portions for the BB8 droid, but rather than look at the pile of provisions in front of her, she sensed an importance to the robot, and also saw its anxiety and trepidation when faced with a new owner. She looked beyond what she could see in her present to what might be integral to her future. The faith was strong in her, just as the Force would prove to be later in the previous movie. 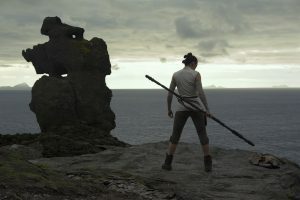 The Last Jedi showcases a more powerful, more driven, more motivated Rey, and Ridley has the role nailed at this stage. Her work on screen with Mark Hamill is extremely effective, as are her moments with Adam Driver. Speaking of Hamill, he’s exactly what he needs to be, and nothing more. He’s the grizzled hero, the fabled legend, jaded through experience, isolation, and plagued by inner turmoil. Luke Skywalker the character isn’t overused, because Rian Johnson knows he’s the biggest draw. Thus, he should be used effectively and efficiently, and we should long to see him. Luke still battles his own issues, including an obvious wavering of worldly hope, and an unfortunately long memory, which could easily be translated to a lack of faith in himself at this stage of his life. But, whenever you see Luke, you get that sensation that you’re watching something special. And, he’s not just a hood ornament. He’s instrumental to the larger story, again, just as he should be. Oscar Isaac’s Poe Dameron is just as headstrong as ever, perhaps more so, and he plays both sides of the coin. His will and his self-image make him think he can do anything, and often times his pride gets the better of him. His fatal flaw is in an inability to listen and breathe, rather than react based on his own knowledge or expectation. He’s a tremendous character, and Isaac is always good, but his fictional flaws are more than merely necessary to reveal that EVERYONE in this world needs teaching, needs redemption, and needs to “hear” the Force. Just as The Force Awakens deepened the religious analogies, The Last Jedi ups the ante even further. The nuts and the bolts of the movie are the same, but the story itself is almost magical in its artistic execution. From an acting standpoint, the younger talent of the previous film show a new confidence and level of stardom this time around, with Daisy Ridley, Adam Driver, and John Boyega all far more assured in 2017 than they were in 2015. Driver, in particular, is markedly better in the sequel than the original (not that he was bad in 2015), and his character is written to a much higher success rate. Kylo Ren lacked teeth in certain key sequences of The Force Awakens, but here he’s arguably the most compelling figure in the movie, and it’s often his decisions that carry the most weight. While no one will ever be Vader, finally the Kylo Ren persona makes sense, and his actions from moment to moment led to me nodding in both continuity and logical approval. Carrie Fisher’s swan song is an enormous success, and watching her, you immediately get the sense of just how important she is to the Star Wars franchise. There’s a feeling of loss as you watch her perform, because you know it’s the last time, and it’s bittersweet. She’s wonderful. You smile when she appears. She’s a wise old friend, and one we’re going to miss. The creatures are in full effect, as always, and if you were worried about the Porgs, rest easy my friends. While they pop up around six times during the movie, they’re short appearances used in the way the Minions were before they were overexposed in Despicable Me sequels. Usually, the Porgs are interacting with Chewbacca, and the results are humorous and brief. This isn’t Jar Jar, it’s not the Ewoks, and I enjoyed the Porgs quite a bit. From a technical standpoint, The Last Jedi is a visually spectacular ride, and trumps its predecessor in just about every way. Color choices and locales showcase the variety of imagination available within the construct of a universe, as opposed to one city or one planet. The action scenes are generally strong, with one relatively late in the movie you’re not likely to forget. Again, it’s tough to do any kind of detailed review here, because telling the reader ANYTHING is unfair and uncalled for, but you’ll know it when you see it. New additions to the cast work well, and I hesitate to mention the bigger names in case you’ve avoided all information. None of the newbies wield egregious screen time, instead maximizing their minutes and playing pivotal, but tertiary story roles that lead to revealed secrets and motivations that otherwise wouldn’t be uncovered. Through all the difficulty these people face, both the newbies and the veterans, the characters discover strength they never knew they had (or needed) and solve mysteries they didn’t know existed. Whether you see it as an analogy to your God or your faith or not, Star Wars fans are going to enjoy it, and science fiction fans are going to love it. It’s a popcorn blockbuster with depth. There’s much more substance behind the style this time around, and this story itself features a few unique choices, particularly the continuing connection between Kylo Ren and Rey (Ridley), which brings back feelings of the best pieces of the Luke Skywalker-Darth Vader relationship of the original trilogy. If I have one particular critique, it would be that The Last Jedi feels like it has multiple endings. I thought it was over not fewer than three times in the final ten minutes, and even when the movie went to black for a second, it would continue. This isn’t a short film, by any means, and it feels its length. I wasn’t bored or checking my watch at any points, but you won’t be surprised when you exit and take a look at the clock. This beast uses every bit of its 152 minutes, dwarfing The Force Awakens by 17 minutes and Rogue One by 19. It could have been 135 and been just as effective, but since it’s such a fun movie, and one with multiple layers to unpack, I wasn’t disappointed to spend the extra 20 minutes in my seat. The stakes are higher, the action is grander, the decisions are bigger, and the execution is more precise. Other than feeling like it lands its plane three or four times, rather than just once, I have very little in terms of marked negativity to write about it. Put simply, after a bushel of words, The Last Jedi is tremendous. You should see it as soon as you can, and you should take the family. It’s loud and there are a few frightening images at times, but nothing to fear as long as your child can handle moderate content. I also encourage the Force vs. Faith discussion, especially for believers, because there’s so much here to dissect and enjoy on that level. My hope as I left the screening was that somebody, somewhere would see it and feel something unfamiliar calling within them that might lead them to open their hearts. As a movie, it’s great. As an experience, it’s something more. The Force Awakens was a rebirth and a lot of fun. Rogue One was good, but inessential and easily dispensable. The Last Jedi is outstanding. Rian Johnson’s story, the cast, the visuals, the John Williams score, and the overall effect of the film all work. It feels like Star Wars, but doesn’t have the nudging of a retread of The Empire Strikes Back…at least not to a degree that should bother anyone. My review? It’s an A. I loved it. I look highly forward to seeing it again…many times. It’s one of the most enjoyable film experiences I’ve had in quite some time. Go in confidence, and may the Force be with you. I’m @JMartOutkick. We’ll see each other again. I believe that.